WTI crude prices have recovered to the $43.75/b-$44.00/b range this morning. WTI prices remained steadily in the $43.23-$43.50/b range yesterday, closing at $43.38/b. WTI opened at $43.49/b today, an increase of $0.33, or 0.76%, above yesterday’s opening price. Prices are trending up, and they have reached $43.94/b currently, an increase of $0.56 from yesterday’s closing price. Diesel opened at $1.38.33/gallon this morning. This was an increase of 0.68 cents (0.49%) above yesterday’s opening price. Current prices are $1.402/gallon, a significant recovery of 2.18 cents from yesterday’s closing price. Gasoline opened at $1.447/gallon today, an increase of 1.18 cents, or 0.82%, from yesterday’s opening. Prices are $1.4609/gallon currently, up by 2.22 cents from yesterday’s close. The price recovery is being attributed mainly to short covering, with analysts noting that last week’s sell-off was overdone. Oil prices also have received some support from weather conditions. High temperatures have boosted demand for air conditioning, and Tropical Storm Cindy may interrupt supplies in the U.S. Gulf Coast. The industry survey expects a 3.3-mmbbl drawdown in U.S. crude stocks, plus a 0.7-mmbbl drawdown in gasoline stocks. Distillate stocks are expected to remain unchanged. Today will be an important day for financial markets, with three key central bankers giving addresses: European Central Bank’s Mario Draghi, Bank of England’s Mark Carney, and the U.S. Federal Reserve Chair Janet Yellen. The Euro strengthened based on Mr. Draghi’s remarks early this morning. The EIA has released data on gasoline and diesel retail prices for the week ended June 26th. 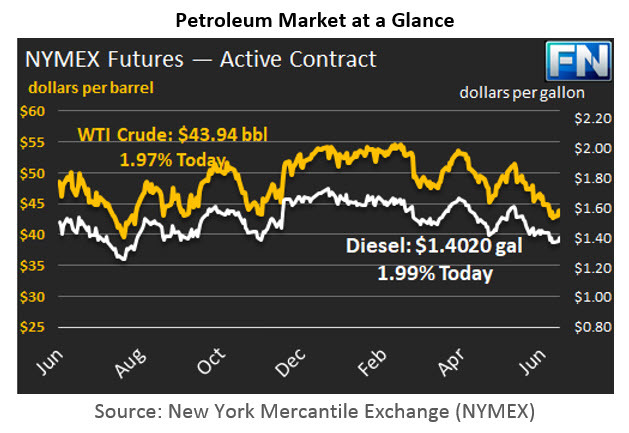 Crude prices have fallen for five consecutive weeks, and product prices have followed. This current week, gasoline and diesel retail prices fell at the national average level, and dropped in all five PADDs. Gasoline retail prices fell by 3.0 cents/gallon. Diesel prices dropped by 2.4 cents/gallon. Gasoline pump prices averaged $2.228/gallon during the week, 4.1 cents per gallon below last year’s price for the same week. Diesel prices averaged $2.465/gallon, 3.9 cents per gallon above last year’s price. The decline in gasoline prices has been significant, and during the month of June 2017, gasoline prices fell below their levels for the same week in 2016. During the most recent week ended June 26th, prices were 4.1 cents lower than for the same week in 2016. Prior to the May-June slump in crude prices, year-2017 retail gasoline prices had been well above year-2016 prices. During the first quarter of 2017, retail gasoline prices were 44 cents per gallon higher than they were during the first quarter of 2016. Details follow in our second article.